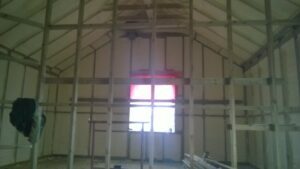 Builder/ Stone mason contracted to complete the barn conversion in Teesdale, County Durham. 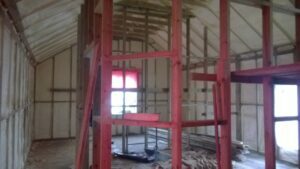 There were several factors which made it difficult when deciding how to insulate the barn being converted. The first issue to overcome here was finding a product suitable for use on the surface of stone as well as block work and sarking board. The property also faced issues with being exposed to the elements particularly wind and wind driven rain, the insulation not only needed to be able keep the house warm but remain unaffected by the elements the property would be exposed to. 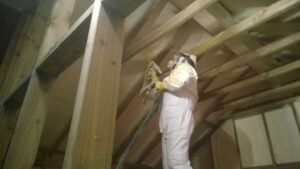 The studded walls were fixed away from the walls to allow for a seamless finish to prevent cold bridging; Our Spray foam product Duratherm was then applied by our improved installers Ecotite. Duratherm was the ideal solution for this barn conversion as its adhesive qualities meant it was suitable for application on Stone, block work and sarking board. The closed cell structure of Duratherm also combats the issues of wind driven rain, as the closed cell structure means the insulation will not be effected by rain water. A well insulated property property protected from the harsh weather elements it would encounter. The external appearance of the property was unchanged and the property also had eliminated draughts and the resultant low air leakage volume, ensured that the living areas will be very comfortable. Because of the construction of the barn (original stone and adjoining new stone cavity, concrete block). To form a continuous, even and high u value insulation. To achieve insulation with no cold bridging. To form continuous vertical damp proof membrane. To form continuous draft proofing over all surfaces. To achieve all the above at varying reveals and abutments with no loss of performance. This method also produces no waste material and because of the speed of installation is cost effective. The installation was carried out in a very professional and courteous manner with a complete understanding of our required specification. 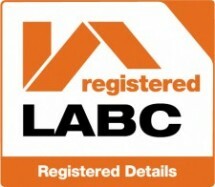 Thanks again for another job well done, we shall be using and recommending your company in the future. If you’d like more information about our spray foam product Duratherm and its uses please click here and more information on our improved installer ecotite can be found here.